Man, this one was a pickle to develop for. The Nintendo 64 SDK compiled for Windows is finicky at best. Some of the platform code won't compile like it does on Linux, and the compiler seems to either generate misaligned code or wrong CPU opcodes. Not a pleasant one to develop for, that's for sure! Nonetheless, if you're interesting in making Nintendo 64 homebrew games, this tech demo could be a decent starting point. 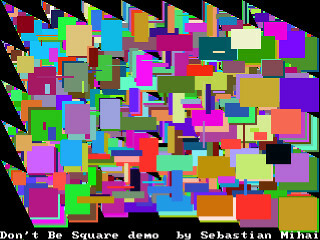 Dev kit with ready-to-compile source code for Don't Be Square - get this if you wish to compile the Don't Be Square ROM yourself, or if you'd like to develop your own games using this as a starting point! Tested in Windows XP. Requires MinGW.